Following on from our fantastic day at St Annes Beach, our holiday continued with a day out with more of Mr MoaB's family - his Mum, sisters and niece & nephew. 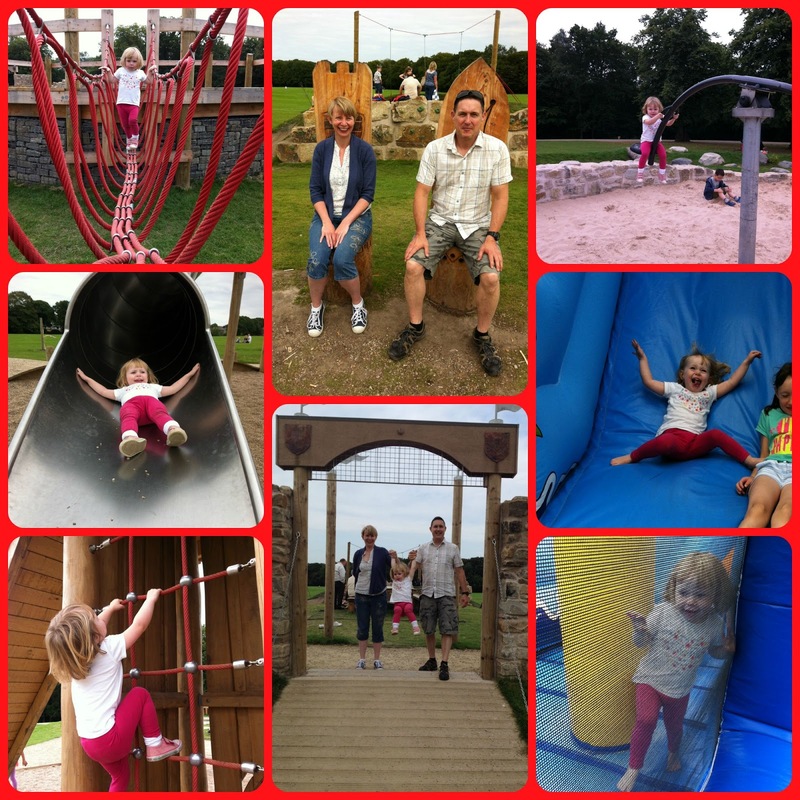 We packed a picnic and went to Astley Hall & Park in Chorley. We visited this park a few years ago but had not been back since. I'd recently spotted on Facebook that they'd opened a new play area which looked amazing so I was really keen to re-visit and I'm so glad we did! The grounds have lots more additions since we last visited. As you enter the grounds, there are some lovely sculptures including an award-winning exhibit from the RHS Chelsea Flower Show - 'The Evaders’ Garden'. The installation is well worth a look and there is a really interesting story behind it. As we passed the lake, we spent a bit of time spotting the different varieties of ducks. Unfortunately we'd forgotten to take anything to feed them with - next time we'll have to remember! We then made our way to the new play area. Wow! It's the best designed playground we've found! 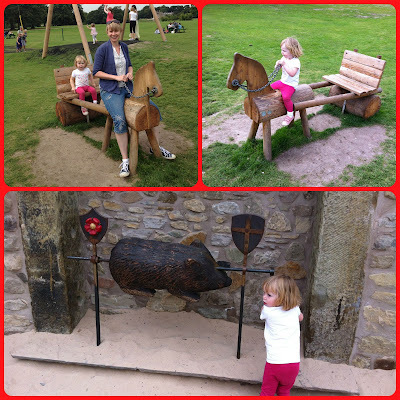 It's all wooden and has a Royalists & Roundheads theme - there's thrones, a horse & cart and even a hog to roast! We had kids of 2, 6 & 9 and they all equally enjoyed exploring the play area and had all the different equipment including slides, swings, climbing frames and zip wires. The playground does suit all ages. On the day we visited, there was also a bouncy castle with slide next to the play area (charge applied) which Little Miss A had a blast on with her cousin. My photos don't really do the play area justice as I've had to be selective with so as not to show other people's children. 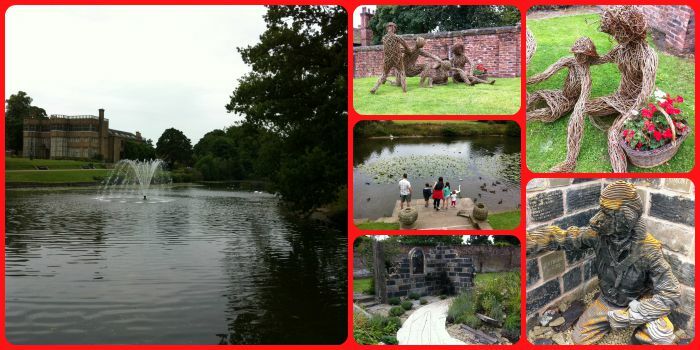 Therefore take a look at this Astley Park's Destination Play Area Photo Album on the Chorley Council Facebook page. The original small playground has been retained so kids can enjoy both! There is a small kiosk for refreshments along with toilets. There is also a Pets Corner with a few animals to see. We visited this last time but didn't get the chance to go in on this occasion. You can also visit the Hall, museum & art gallery plus there is a larger cafe. There's lots more of the grounds that we haven't explored yet including a wooded area. The grounds are free to go into and it's free car parking so it's a great family day out on a budget! 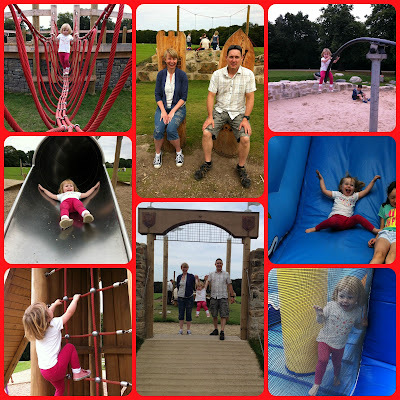 If we lived nearer, we'd definitely be regular visitors to the Astley Park Playground! We'll definitely be back on future visits to see the family. So wish we had a playground like this nearer to us. At least we can visit again when we see Mr MoaB's family. Looks and sounds awesome! I love the wooden horse and the park looks epic! My children would love it, hehehe. #WhateverTheWeather. I know. I loved the pig on a spit! So different but lots of fun. More playgrounds should be like this! This looks a fab area for the kids to enjoy. I love it when they have things to cater to all ages, one of our local parks is quite annoying as most things are for older children, with just one or two things for littler ones to do, which means the little one is bored well before my 4 year old is finished playing! I love that this park is so varied, but allows kids of all ages to play together. Thanks Karen. I love wood too and so nice to see it used to such great effect to create such a great playground.